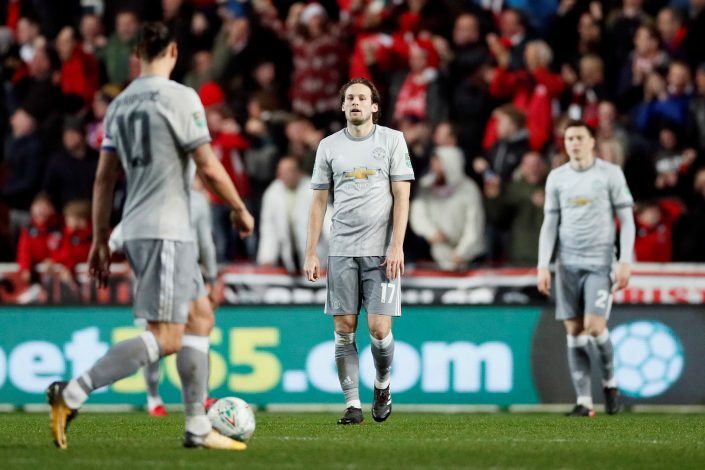 Defending champions Manchester United crashed out of the Carabao Cup in a 2-1 defeat to Championship side Bristol City, as Korey Smith scored a dramatic stoppage-time winner to send his team into the last four. The Old Trafford unit had a strong team despite some of the regulars getting a rest. Jose Mourinho saw his men fall behind to a spectacular opening goal by Joe Bryan, before Zlatan Ibrahimovic fired home an equaliser. As the match looked destined for extra-time, the home side pulled off a remarkable victory, with Korey Smith striking in the last minute of the injury time. Belgian striker Romelu Lukaku came in at the hour mark and put in a commendable show, after linking well upfront and getting the opponent goalkeeper to make some good saves. But it wasn’t enough, with the hosts taking the game to their fancied opponents and pulling off a stunning win, as Ashton Gate erupted. The Championship side has beaten four Premier League teams including United in their journey to the semi-finals so far, and the reward they got was a trip to the Etihad, as they square up against Man City next. In the deafening loss, the away team fans vented out their feelings on two players, who they feel need to shipped out soon. The duo includes Matteo Darmian and Daley Blind. Darmian got a rare start at right-back after his horrific show against FC Basel in the Champions League earlier, and had a forgettable night, as the United fans showed no mercy on social media site Twitter. Daley Blind was deployed as a holding midfielder, but failed to convince as well. The Dutchman although had an important moment on the pitch to stop Smith with a well-timed last-ditch tackle when the midfielder had skipped through on goal. With Alex Tuanzebe waiting for his chance, many feel the youngster deserves a show ahead of Darmian. The upcoming weeks will give us an indication as to whether the fans’ voices will be heard by Jose Mourinho.